20 grams of 14K gold, 7mm wide, always in style and ready to wear. 15.3 grams of 14K gold, 6mm wide. This classic figaro style will always be in fashion. 8.9 grams of 14K gold 5mm wide! 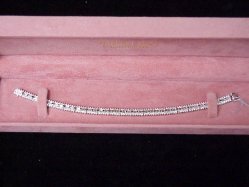 A well made fashion bracelet. 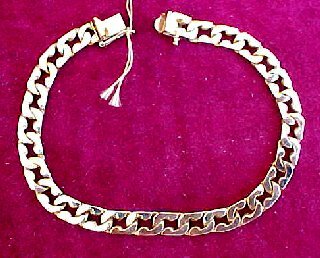 14K gold charm bracelet 8mm wide! A fun way to show your personality with charms. 31.7 grams of 14K gold, 9mm wide with brushed and satin finish. ESTATE! 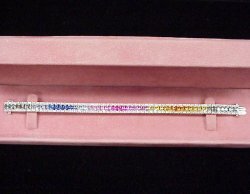 Gents bracelet, 18K two-tone gold with diamonds, 27.4 grams. VERY NICE! 14K Charm bracelet 10mm wide! Extra heavy to hang all of your pretty charms. 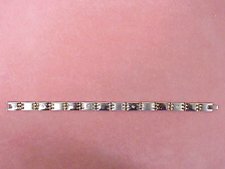 5 gram 14K gold bracelet 5mm wide! Classic style for everyday wear. 14K Italian gold box-style bracelet 2mm wide! 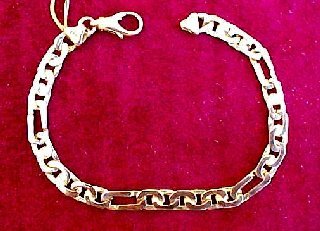 8.6 gram 14K Italian gold bracelet 4mm wide!